After four years, over 1,500 posts and a lot of shared opinions, the Vees blog is moving. With the implementation of the new Vees website, the team now has a shiny new toy to promote and show off. Before the Vees website was aesthetically outdated and not very user-friendly for navigation or content. We are learning and still working out the kinks but the new site is also a WordPress domain and has all the functionality of this blog, being WordPress as well. So, with that, it makes sense to have everything under one roof, instead of having two things competing against each other. Don’t worry, nothing is going to change, except where you find all your Vees content. I will still be posting previews, post-game thoughts, video and audio features, alumni news and much more, but just at the new address. Easy to follow, just log on to the Vees website and on the homepage, you’ll notice a tab at the top of the page that reads “Three V’s Blog.” Just click on that and you’ll find all the latest posts and news on the team. If you want to bookmark the direct link to the new home of the Vees’ blog, it’s below by copying and pasting in your web browser. Or, click the “CLICK HERE” and it will take you directly to the new address. Thanks to all those who’ve been following the blog and take time to reach out and talk Vees hockey. Hope you all continue on following the blog at its new home. The Penticton Vees ring in 2016 the way the ended 2015- battling a division rival. The Vees head up to Vernon tonight to face the Vipers at Kal-Tire Place, as both teams are playing their first games since the Christmas break. The Vees last played on December 19th, a 3-2 win at home over the West Kelowna Warriors, as part of a pre-Christmas home-and-home. Vernon was last in action on December 20th, when they picked up a 5-2 Sunday matinee victory over the visiting Powell River Kings. Don’t worry if you get a sense of déja vu when looking at the Vees schedule over the next two weeks. The Vees play the same two opponents, on the same two days, in the same venues over the next two weekends. Tomorrow night they host Salmon Arm at the SOEC, then it’s right back in Vernon next Friday, with Salmon Arm coming to Penticton, again, next Saturday. One of the biggest Christmas wishes for Head Coach Fred Harbinson was probably health, as over the last three months the Vees have been stricken by injury. At it’s worst, the Vees were playing without six regulars in their line-up but managed to fashion a 3-2-1-0 record over those six games in December. Well, the good news is the cavalry has arrived. Back from injury is defenseman Seamus Donohue and forward Dixon Bowen, both missed a combined 28 games. Donohue hasn’t played since November 1st after suffering an injury in a game against Trail, and Bowen was hurt in Langley on November 20th. Also back from international duty is Captain Tyson and Assistant Captain Dante Fabbro. They last played on December 4th, before going off to the World Junior ‘A’ Challenge in Ontario, where they won a gold medal with Team Canada West. Despite their absence the pair are still near the top in the BCHL scoring race. Jost is still third in overall points, with 61 in 30 games, even though he’s played eight less games than league-leader Sheldon Rempal. Fabbro is second in defensemen scoring, with 38 points, just six back of leader Yanni Kaldis, who has 14 games on the Vees rear-guard. Speaking of the scoring race, Scott Conway, who’s second overall in the league with 68 points, has been a snake charmer this season. Conway has seven goals and 11 points in four games against the Vipers, including a four-point effort back on December 15th, when these two teams last played. Odeen Tufto and Liam Finlay both have four points against the Vees this season for Vernon. 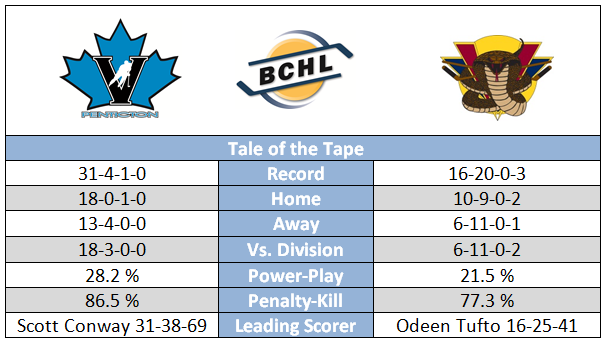 The Vees have had the Vipers number this year, as they’ve won all four match-ups in the season series, including the only game in Vernon. Penticton has grown to be quite comfortable inside Kal-Tire Place in recent years too, as they’re 10-4 in Vernon over the last five years. These two wrap-up the season series next Friday. Zach Driscoll will get the start in goal for the Vees tonight and comes into the game with a 12-3 record, while sporting a 1.88 goals-against average, and he owns a .937 save percentage; he’s the top goalie in the BCHL. Driscoll won his only start against Vernon back on December 4th, when he stopped all 28-shots he faced in a 3-0 win. Vernon will likely counter with Andrew Shortridge, who owns a 13-16 record, to go along with a 2.94 goals-against average and a .918 save percentage; he’s the goalie of record in all four games against the Vees this season. From everyone in the Vees organization, Merry Christmas to our fans, sponsors and fellow BCHL members. If you celebrate, have a wonderful Christmas with family and loved ones. You may have noticed the Vees website has gone under a significant face lift this week. It’s part of a makeover to all 17 team websites and the BCHL site as well. The league has switched to a new provider, Hockeytech, and over the next few days and weeks, we will be tweaking content on the website; learning as we go. But it’s an exciting change not only for the Vees but the entire BCHL and we look forward to bringing you a more modern and enhanced product. 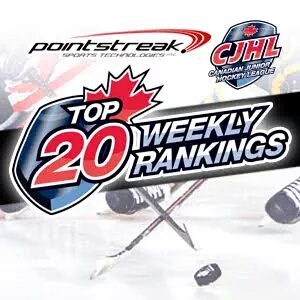 Yesterday the CJHL released its final Top 20 Rankings before the Christmas break and the Vees saw themselves slip one more spot down to third this week. Again, not surprising as the Vees were missing six regulars from their line-up over the last two weeks but impressively went 3-2-1-0 in those six games they missed all those players. The Vees enter the break with a 31-4-1-0 record, 17 points ahead of second place in the Interior Division. With the holiday break underway, or nearly underway for all ten leagues in the CJHL, a huge congratulations goes out to Canada West, who took home the gold medal over Team Russia at the 2015 World Junior ‘A Challenge. As well, another huge pat on the back goes out to the Coburg and Whitby organizing committees, all their volunteers and OJHL for hosting a wonderful event. In the BCHL, the Penticton Vees had another small hiccup this past week and they will look to rebound in the New Year when their top players return from the Canada West roster. In the AJHL, the Brooks Bandits have extended their winning streak to nine games, and have moved closer to the overall standings leader – the Spruce Grove Saints. The Melfort Mustangs remain in a tight battle for top spot overall in the SJHL with the Battlefords North Stars. The Portage Terriers remain at the top of the MJHL, but find the Winkler Flyers and the Steinbach Pistons breathing down their necks in the overall MJHL standings. The Fort Frances Lakers in the SIJHL continue their strong grip on first place, while the Soo Thunderbirds, Powassan Voodoos, and the Cochrane Crunch are continuing to dominate in the NOJHL. The Trenton Golden Hawks are still running away from the rest of the OJHL, while the Ottawa Jr. ’A’ Senators have zoomed back into second place overall behind the Carleton Place Canadians in the CCHL. The College Francais de Longueuil of the QJHL have slipped ahead of the Montagnards de Sainte-Agathe, while the Summerside Western Capitals continue to hold onto top spot in the overall standings in the extremely competitive Maritime Hockey League. On behalf of the CJHL and the Pointstreak Top 20 Weekly Rankings, we extend our best wishes to all the players and their families, our teams and their fans, for a wonderful and safe holiday season. The rankings will return on January 4, 2016. Ben Brar will need a knew helmet after today because his head will be too big. 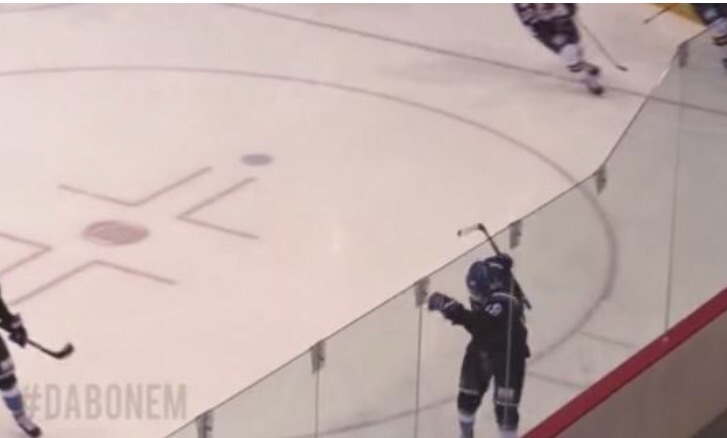 The Vees’ forward celebration against Vernon last week is going viral on social media. TSN website “Bar Down” has done a story on Brar’s celebration known as the “Dab,” which was made popular by Carolina QB Cam Newton. The Vees went into the Christmas break on a winning note Saturday, edging the West Kelowna Warriors 3-2 at the SOEC. The Vees salvaged a weekend split with the win and remain undefeated at home with an 18-0-1-0 record. Like many of the players, it was an early start for myself on my commute home to Nanaimo to visit family during the Christmas break. Today’s for some R & R. I’ll have an in-depth recap of the weekend on Monday morning. 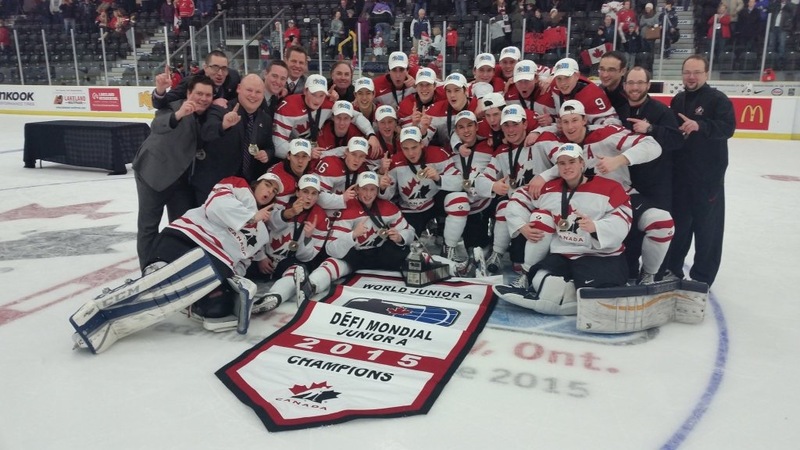 Dante Fabbro, Tyson Jost and Team Canada West captured gold at the 2015 World Junior ‘A’ Challenge this afternoon in Cobourg, Ontario. Canada West edged Russia 2-1 in the Gold Medal game and Jost scored the game-winner late in the third period; Fabbro assisted on the winner. 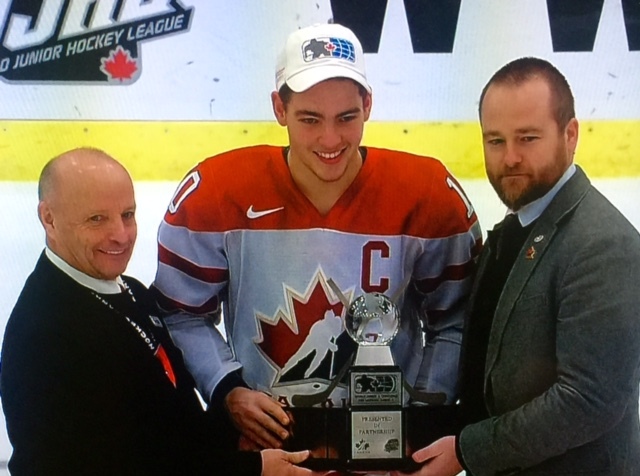 Jost led the tournament in scoring with three goals and nine points in four games. Fabbro chipped in with three assists from the blue-line. This is the second gold medal this season for the two, as they won gold with the Canadian Under-18 team at the Ivan Hlinka Memorial Cup in the Czech Republic in August. This is Canada West’s first gold medal since 2011, when they won the event in Langley, BC. Courtesy of World Junior ‘A’ Challenge Twitter account.